Are you an ELF? 19 days to go as the Kings of Hallyu Wave, Super Junior will return to the country for the nth time. If you attended SuShow 2, 3 and 5 (Super Show), you'll never miss out the chance to take a glimpse of them for a one-night show that will be held on June 30 at the Mall of Asia Arena. 1. 5 years in the making after SS5 was held in the country. After its successful 2013 stint in Manila, the boys are back minus Kyuhyun and Ryeowook currently in military service; Kangin and Sungmin on hiatus. Super Show 7 is the fourth world concert tour and seventh international tour, in support of their eighth studio album, Play. 2. A lot of ELFs awaits one of the best fan services in KPop every Super Show. Wait until Siwon strip off his shirt. 3. The power of sapphire blue. ELFs unite waving the official lightstick of Super Junior. 4. You will amaze to fan projects made by PH ELF. It is the sign of their love to our beloved boys. What will it be? Can't wait to see it. 5. Trip down the memory lane with several SJ songs such as No Other, Sorry Sorry, Mr. Simple, among others. Most of their songs became the epitome of KPop scene. 6. The return of Yesung and Shindong from Super Show after his enlistment in 2013 and 2015 respectively. Also, this is a significant event for Super Junior leader, Leeteuk. It's his first Super Show in Manila after 7 years. He was absent during SS5 Manila in 2013 due to his military service. Also, his natal day falls on July 1, the day after SS7 Manila. 7. Forget being an ahjumma (auntie) for one night. Think that we're still in our 20s and enjoy our time seeing our ahjussis. 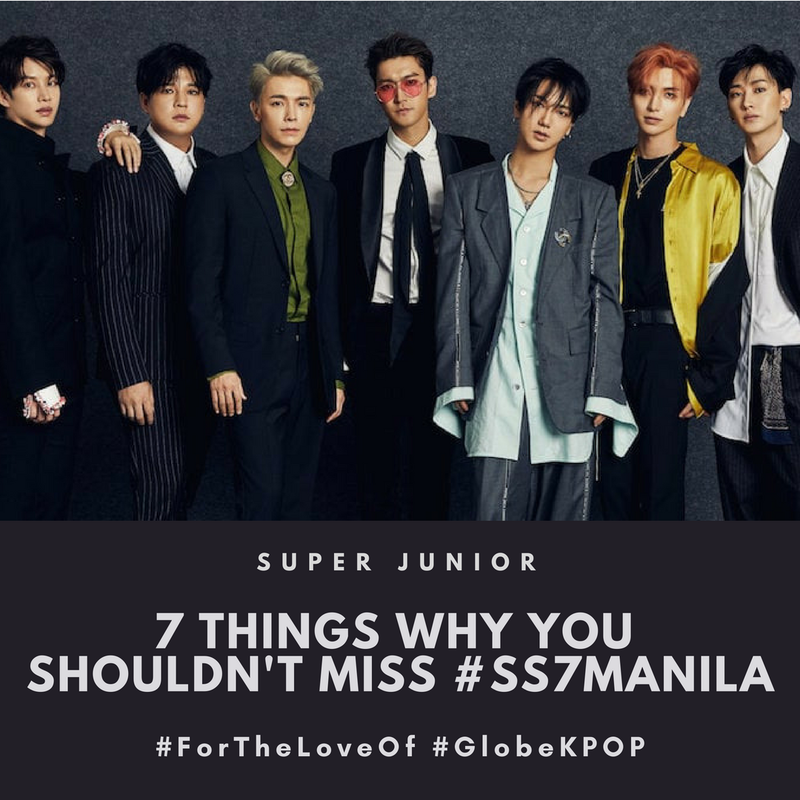 Super Show 7 in Manila is presented by Pulp Live World, Globe Telecom, Dream Maker Entertainment Limited, Label SJ and S.M. Entertainment.